2013 was a great year for racing. We had a four-time world champion. The nicest guy in racing won the Indy 500. Some guy named Robby formed what is perhaps the best racing series of all time, and it's brand new. Oh, and a Frenchman Italian got slapped, hilariously. 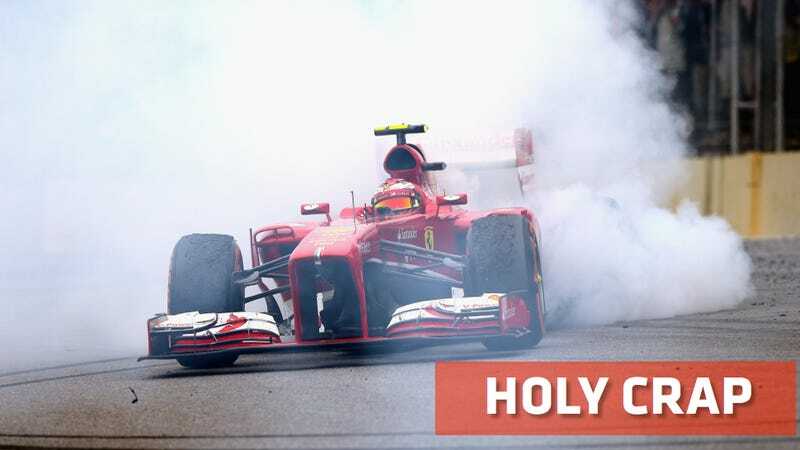 These are the craziest racing moments of 2013. 13. Samir, You're Breaking The Car! "Shut up. Don't tell me how to drive." Being the most successful driver in WRC history is clearly not enough for Sebastien Loeb. One of the best racers ever on four wheels entered a Scorpion Masters motorcycle race, and beat more than half the field. And that field was made up of guys who are paid to race on just two wheels. There is not enough money in the world to pay me to drive up a hill that big that fast. Who says that everything good has been invented already? Throw ridiculously overpowered trucks, ridiculously oversized tires, ridiculously low levels of grip, and a few jumps together, and you've got a great mix. Now put it on pavement. Oh, and one of the drivers isn't even technically old enough to drive in some states. The Stadium Super Truck Series is my new favorite. He sits in a car and he drives," McNabb said. "That doesn't make you athletic... What athletically is he doing?" They don't call him "Butterfingers Bourdais" for nothing. Well, actually, they don't call him that at all. But I'm going to start doing so. I hear the guy races okay. In fairness, the debacle that was the WTCC qualifying at the Salzburgring made tactical, logical sense. It just was one of the weirdest parts of racing all year. 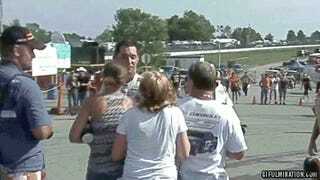 Max Papis went on to claim that the slap dislocated his jaw. You may mock poor Papis, but Kelly Heaphy has a prosthetic hand made out of nothing but pure cast iron. True story. On the other hand, maybe a slap is sometimes the safest way to deal with things. Tony Kanaan won the Indy 500 in an incredible race. And it couldn't have happened to a nicer guy. When was the last time you saw racing this good, with a four-wide finish? As we said then, FOUR WIDE.